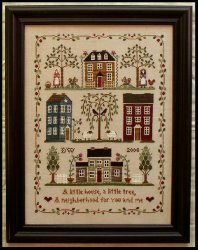 Little House Neighborhood SAL: Hello fellow LHN stitchers! I now have my 'Neighborhood' chart and picked out a nice 32ct light mocha Belfast linen from my stash. I really wanted to use a hand-dyed piece of Lakeside Linen fabric but I didn't have any in my stash (Shocking, I know!) and I don't want to wait to start this project. Just need to pull my DMC and I'm ready! Thanks for having me on this SAL. What a great idea to blog it and everyone's progress! Thanks, Nicole!